(New York: Penguin Books, 2001), 672 pages. I am a senior history major with a love for various historical time periods and a specific interest in World War II. I have been interested in the Holocaust since I was young, and my interest in the subject grew after I visited the Museum of Tolerance in Los Angeles in the eighth grade. After taking a class on the Holocaust with Professor Marcuse last year, my interest in German history grew even more. Since I am planning on going to law school after graduation, I chose to read this book because of its connections with international law. Furthermore, I hope to someday practice criminal prosecution, and I thought that this book would be a valuable insight into what goes on before the actual trials begin. In Interrogations: The Nazi Elite in Allied Hands, 1945, Richard Overy provides readers with a privileged account of the defendants before their trial at Nuremberg. In the first portion of the book, Overy analyzes the major war criminals, the charges against them, and the way the Allied forces handled the entire situation. He discusses in great detail the processes that were necessary to choose the defendants, and the crimes they would be charged with. In the second half of the book Overy provides readers with the transcripts from the pre-trial interrogations of the prisoners. In my review, I focus on explaining the struggles that the Allied forces faced as they prepared for the trial, and how that affected how the trial was structured. Lastly, I critique the transcripts at the end of the book that I found informative, but dull. All in all, I hope this review gives readers a bit of information about Richard Overy's work and about the complicated and intricate structure of the Nuremberg Trials. When World War Two ended, the Allies had their work cut out for them. Without Adolf Hitler many questions about the Third Reich remained unanswered. Prior to the end of the war when it became clear that the Germans faced defeat, the Allies began to prepare for what would later be called the Nuremburg Trials. Here the Allies prosecuted the top echelon of the Third Reich for their alleged war crimes. In Interrogations: The Nazi Elite in Allied Hands, 1945 Richard Overy provides readers with the actual transcripts from the interrogations with the twenty two major war criminals that the Allies put on trial. The book, broken down into two parts, dissects the stages leading up to the trial as well as some of the interrogations themselves. According to Overy, the Western Allies set out to undertake “moral rehabilitation of the German people” and the trial was “part of that process, weaning Germany away from… ‘the spirit of totalitarianism'”(Overy, 206). With this goal in mind, Overy's book sheds light on the difficult task the Allies had to undertake in order to prosecute the war criminals and illuminates the struggle the Allies had in getting truthful answers from the defendants. Furthermore, Overy's research shows that because of the frictions between the Allies at the end of the war, and because of the uncertainly of how to proceed with the trial, the goal of “moral rehabilitation” could not effectively be achieved. Deciding who to charge with war crimes and how was the first obstacle that the Allies had to tackle. During the 1945 debate on how to handle the German war criminals, Winston Churchill made no effort to hide his enthusiasm for capital punishment, stating that the “Hitler Gang…should be shot to death without reference to higher authority” (Overy, 6). Ironically, the Soviets played the major role in convincing the British and Churchill that a trial would be more fitting, and the Soviets felt that the “German defeat was an opportunity for a “‘show trial' on a grand scale” (Overy, 8). In the end, despite the differing views between the major powers, they reached an agreement on August 8 th, 1945 to establish an international military tribunal where each power (Britain, Soviet Union, United States, and France) would have one judge and one counsel appointed for the trial. (Overy, 15). Despite reaching an agreement on how to try the criminals, undoubtedly frictions between the Soviets and the British and American powers remained. In fact, the Soviets were “under orders to keep themselves apart from the western officials” (Overy, 17). This kind of split clearly led to problems considering they had to work together to handle the war criminals. The next big struggle between the Allies came when trying to determine whom to classify as an actual war criminal. Clearly, major crimes had occurred during the war, specifically against the Jewish population, yet pinning specific crimes on certain individuals proved much harder than the Allies thought. Originally the list of criminals included Italians, but as time passed, the list became solely German. Since the Allies had already occupied Italy since 1944, they did not want to create political trouble by trying Italian officials (Overy, 29). Without the Italians, the list of the major criminals became primarily officials of the Nazi Party. The Allies agreed to put some people on that list that undoubtedly played a role in the Nazi regime, yet they also included some lesser-known people to serve as representatives of organizations. This idea of “collective guilt” made it possible to criminalize groups such as the SS or the Gestapo as an entire body, while only actually prosecuting one individual representative of the group (Overy, 31). In this sense, the Allies stretched the limits of international law to fit their needs for trying the major villains of the Third Reich. The Allies presented the list of criminals on August 29, and produced a finalized indictment on October 6 which included individual criminals and also people used to prove the criminality of larger groups. In his discussion of the indictment, Overy points out that the Allies created the completed indictment before they finalized the actual charges. As previously stated, the main problem the Allies faced was producing enough evidence to convict the defendants of specific crimes. The solution to overcome that problem was to create the crimes to fit the defendants. In the end, the Allies successfully tried the defendants by charging them with conspiracy. By charging the defendants with “conspiracy to subjugate Europe,” the Allies could effectively allow a range of crimes to fit under this overarching crime (Overy, 47). In addition to the conspiracy charge, the Allies included three subsequent charges to the indictment: waging aggressive war, perpetrating war crimes in violation of international law, and planning and perpetration of other persecutions inside and outside of Germany (Overy, 49). While the defendants indeed violated laws during the war, creating charges after the capture of the defendants was controversial to many legal authorities and scholars. Nevertheless, the charges remained, and through the use of interviews the Allies determined the guilt of the specific defendants. By the time the interrogations began in August 1945, the defendants awaited trial in one of two camps, Mordorf les-Bains and Kransberg Castle. The British ran the camp at Kransberg, which functioned under the code name “Dustbin” (Overy, 60). The conditions of this camp far exceeded those of its sister camp, “Ashcan” (Mordorf) as prisoners could retain some basic freedoms. Contrastingly, at “Ashcan” the conditions kept prisoners to a strict daily regimen, which allowed only small portions of food, bare necessities, and required that the prisoners remain silent (Overy, 61). Perhaps being forced to live in silence encouraged the prisoners to talk once the interviewers finally interrogated them. The interrogations themselves however, were no less rigid. The prisoners had to face “a permanent team of eight interrogators, whose identity was shielded from the prisoners by false name and rank” (Overy, 63). Overy does not discuss in detail the reasoning behind this procedure of falsifying the interrogators identities, which leaves readers curious to know the legality of such a process. The interrogations provided the Allies with crucial information that they could use to gain insight into the Third Reich. Nevertheless, the transcripts did not provide as much detail as an interrogator, or a reader, might hope. The interrogations lasted approximately two hours each, which included time for translation and interpretation that took up a good portion of the interview time, especially when the Soviets were included and the interview needed to be translated twice (Overy, 79). The questions asked by the interrogators focused a lot on Hitler and his rule in an attempt to unravel what motivated Germany to move into war and to explain its subsequent aggression. The Allies engaged in this line of questioning no doubt to try to establish the guilt of the prisoners on the conspiracy charge. By examining the actions of the German army, Luftwaffe, and Hitler's overall goals, the Allies could establish the relative guilt of each individual and various organizations. As a reader, one might hope for the book to specify how the war criminals behaved during interrogations, and Overy does an excellent job at detailing the nature of the interviewees. He specifically addresses Rudolf Hess, Albert Speer, and Hermann Goering, by providing each of them their own chapter withn the first section of the book. These three men provide perfect examples of how imprisonment could have different effects on individuals. As a dedicated follower of Hitler and deputy party leader, Hess could have potentially revealed a plethora of important facts to the Allies. Instead, he suffered from what some speculate to be self-induced amnesia, produced as a result of the hysteria of being imprisoned. Though he had little or no memory of his Nazi past (he could not even remember Goering!) the court still convicted him and sentenced him to life in prison for conspiracy and crimes against peace (Overy, 12). Speer and Goering, as detailed by Overy, proved much more insightful and interesting than Hess, though neither of them ever confessed to any major crimes. Speer was unique because he actually informed officers that he had been “disillusioned by Hitler and the regime…and would not attempt to avoid his responsibility” (Overy, 135). Yet despite these assertions he still claimed that he was never a perpetrator, but rather an “accessory” (Overy, 138). Reich Marshall Goering, as one of Hitler's top men, displayed no signs of regret for the actions of Germany. He made it clear that he felt that Hitler “had the answers” and though he never admitted to anything either, he did openly say that he agreed with Germany's expansionist policy, its racial discrimination and its disregard for international agreements (Overy, 152). Amazingly, most of the defendants remained loyal to Hitler, and actually tended to blame Himmler for the war crimes instead (Overy, 107). Tellingly, Himmler's widow was the only one to blame Hitler for the concentration camps (Overy, 110). The transcripts as well as Overy's text make it apparent that these men did not regret their actions, and in fact, most of them denied even being a part of anything criminal. The excuse that Hitler ran the Reich on his own agenda seemed to be a prevailing theme throughout the interrogations. With Hitler, Himmler, and Goebbels dead, and Borrman and Eichmann missing, most of these party members could easily feign ignorance of Germany's actions in order to demonstrate their innocence. 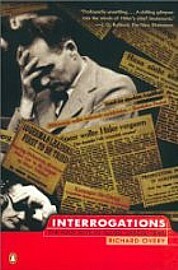 In Interrogations Richard Overy does an excellent job at highlighting the struggles that the Nuremburg Trials brought about, and gives readers deep insight into the minds of the war criminals. His analysis of the trials in the first portion of the book provides good background information before he delves into the interrogations in the second half. Overy structures the book in a way that a reader can easily follow, while also offering readers incredible analysis of the trials and the procedures that led up to them. Unfortunately, the second portion of the book containing the transcripts does not show the same power and force that the first portion of the book does. One would expect these interrogations to be vivid and full of information describing German behavior during the war; however, because the majority of the prisoners refused to admit any guilt, the interviews are full of “I don't remember” statements. The interrogations better serve the interest of those who wish to know the specifics of the German military actions, not the concentration camps. Overall, Overy shows how the behaviors of the Nazi party members during the trials provide a glimpse into the struggles that the Allies would face in the ensuing years with the entire German population: denial, “amnesia”, and insistence that the Nazi party was actually good for Germany. The “moral rehabilitation” that they sought to impose on the German people, as detailed in this and other books, did not come easily for the Allies. The Nuremburg Trials themselves show how convoluted the actions of the Third Reich were, and how difficult it would be to “undo” the wrongdoings of the Nazis and start fresh. Tim Coates gives Richard Overy a stellar review. He praises Overy for his use of the transcripts and states that he “demonstrates that the most revealing history lies in the language of the time.” Coates makes no mention of any problems with the book, and instead claims that everybody should read it, not just those interested in history. Unlike the review by Tim Coates, Sheehan explicitly points out some flaws in Overy's book. While he praises the work of Overy, he criticizes the actual documents and testimonies that Overy includes in the second part of the book. He calls the documents “dull” and “boring.” Sheehan's assessment of the documents is for the most part correct. One would expect these documents to be fascinating and full of insightful information, but at some points they are very dry. This review would be good to read before reading Overy's book because it does give a very honest opinion of the book as a whole. This is one of the most helpful websites for anyone who wants to know all about the Nuremberg Trials. The author provides a sidebar with links to go to various different pages. The links include a chronology of events during the trial, famous pictures, diagrams of the courtroom layout and more. Most importantly, it provides some actual transcripts, which fits perfectly for anyone who chooses to read Richard Overy's book, Interrogations: The Nazi Elite in Allied Hands, 1945. This website is provided by the United States Holocaust Memorial Museum. It offers information on several topics related to World War II and the Holocaust. The page on the Nuremberg Trials allows people to click on different links that direct you towards testimonies, pictures, and artifacts. What makes this site unique is that viewers are allowed to comment on the actual website. A question is posed (what is justice?) and people can respond and then other visitors to the site can read those actual responses. It gives a hands on approach to the topic. The site also provides several additional links to other informative websites that discuss the trials. This website was created by Harvard students, and uses actual documents from the trials to analyze and discuss the trials. What makes the website very interesting is the ability of the visitor to click on the documents and see photocopies of actual letters, documents, and files that were written during the trials. Also, the authors provide an English translation of the documents. The one downfall about the website is that the layout is not very user-friendly. There is lots of information on the site, but the small font makes it hard to read. For those interested in the military aspect of the trials, this website would be very helpful. The United States Library of Congress provides it, so it gives a more American view of the trials. Like the other websites, it gives viewers a chance to look at transcripts and text from the trials. However, a major problem with the site is that it requires Adobe Reader, and thus the documents are not easily accessible. In general the site provides good information, but it is kind of bland, and not as exciting as the other websites. Gilbert, GM (1995). Nuremberg Diary. New York, New York: First Da Kapo Press. (488 pgs). G.M. Gilbert, who served as the prison psychiatrist at Nuremberg before and after the trials, wrote this book. In this book, Gilbert documents the behaviors of the war criminals as they awaited their trial. The book contains “off the record” information about the defendants and their opinions on a variety of subject matter. This book would probably complement Overy's book very well, and provide readers with another chance to see the defendant's characters. Goldensohn, L (2004). The Nuremberg Interviews. New York, New York: Random House. For those interested in Overy's book, this book is a must read. It parallels Overy's book completely except that the United States army psychiatrist wrote it. In his interviews with the defendants, Goldensohn attempts to learn more about their childhood and their past, not just the events that took place in the Third Reich. Although this book is probably rich with information, readers must read it was a skeptical mind. No doubt the psychiatrist asks some biased questions since the United States Army employed him. BBC News , "Nuremberg Trial of Nazis Begin." (November 20, 1945). Through the archived BBC website, readers can search for major news events that happened in history on specific days. On November 20, 1945, the front page news story was about the start of the Nuremberg Trials. The article is very short and straightforward and gives basic information regarding the war criminals and the crimes they were charged with. This article is not very helpful for those wishing to do extensive research on Nuremberg, but it is quite fascinating to see the actual newspaper from 1945. Additionally, since the article is online, BBC included a side column next to the article to add contextual evidence about the eventual outcome of the trial. Plagiarism—presenting someone else's work as your own, or deliberately failing to credit or attribute the work of others on whom you draw (including materials found on the web)—is a serious academic offense, punishable by dismissal from the university. It hurts the one who commits it most of all, by cheating them out of an education. I report offenses to the Office of the Dean of Students for disciplinary action.